I reviewed SHOOT LIKE A GIRL: ONE WOMAN'S DRAMATIC FIGHT IN AFGHANISTAN AND ON THE HOME FRONT (Berkley Publishing Group​) by Mary Jennings Hegar for Lone Star Literary Life. This is an eye-opening military memoir of Hegar's fight to be a pilot. An adrenaline junkie with attitude, Mary Jennings Hegar knew she wanted to be a fighter pilot since she watched the exploits of Han Solo and the Millennium Falcon. Supported and encouraged by her family, she joined Air Force ROTC at the University of Texas at Austin. Hegar became a helicopter pilot, fighting wildfires in California, eradicating marijuana in national forests, providing hurricane support in Texas, and executing long-range overwater rescues over the Pacific Ocean. Ultimately, Hegar deployed to airfields and forward operating bases in Afghanistan three times as a Medevac pilot. Shoot Like a Girl: One Woman’s Dramatic Fight in Afghanistan and on the Home Front is the memoir of Major Mary Jennings “MJ” Hegar, recipient of the Purple Heart and the Distinguished Flying Cross with Valor. Shoot Like a Girl is a straightforward, chronological narrative of Hegar’s ambition to fly for the United States, the triumphs and trials along the way, and her determination to succeed despite arbitrary obstacles thrown into her path solely because of her gender. Hegar’s first experience of discrimination was in high school, when a trusted teacher refused to write a letter of recommendation for ROTC. The discrimination continued when her first commander refused to return her salute; when her chain of command took her husband’s job into consideration when making decisions about her professional future; when her squadron members practiced outright sabotage; and when she experienced sexual assault by an Air Force doctor during a physical that would determine whether Hegar would attend pilot school. She would eventually lobby Congress — and sue the Secretary of Defense in Hegar, et al. v. Panetta. 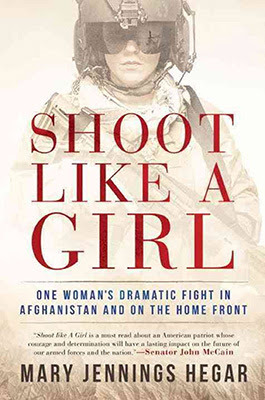 The front cover of Shoot Like a Girl carries the recommendation of Senator John McCain, and features an arresting photograph of Hegar in full battle gear, the edges of her body indistinct, merging into the Kandahar Mountains backdrop. Submitted as required to the Department of Defense (DoD) for vetting before publication, Shoot Like a Girl retains DoD redactions in the form of thick black rectangles obliterating sensitive details. Filled with illustrative anecdotes and humor, Shoot Like a Girl sports an eye-catching first line. “I glanced out the window at the dark shadows of sharks just under the surface of the sea,” an experience which took place during refueling midair, as she was piloting a helicopter two dozen feet from a C-130 tanker at 120 miles per hour. Despite a usually engaging voice, Shoot Like a Girl is Intermittently dry, and although it loses momentum in the second third it recovers nicely. The action passages are nerve-racking (“As [machine-gun] rounds impacted the tail and slowly started moving forward as the enemy maneuvered the heavy gun, our eight-ton aircraft rocked like a little rowboat on the ocean”), the recounting of disrespect (even while soaked in jet fuel and covered in her own blood) breathtaking, the discussion of aviation-combat tactics fascinating.